Dual technologies are combined in the CalGlow magnetic and electrolytic scale inhibitor. Suitable for installation on cold water lines, for preventing the build-up of limescale. 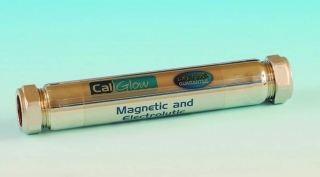 CalGlow is supplied with choice of either 15mm or 22mm compression fittings. No earth bonding needed.